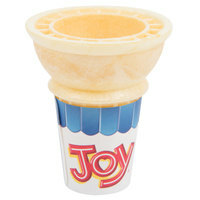 Serve your sweet treats in this Joy #310 sugar ice cream cone! Appeal to everyone's sweet tooth, and offer new, profitable menu items at your ice cream shop or cafe. 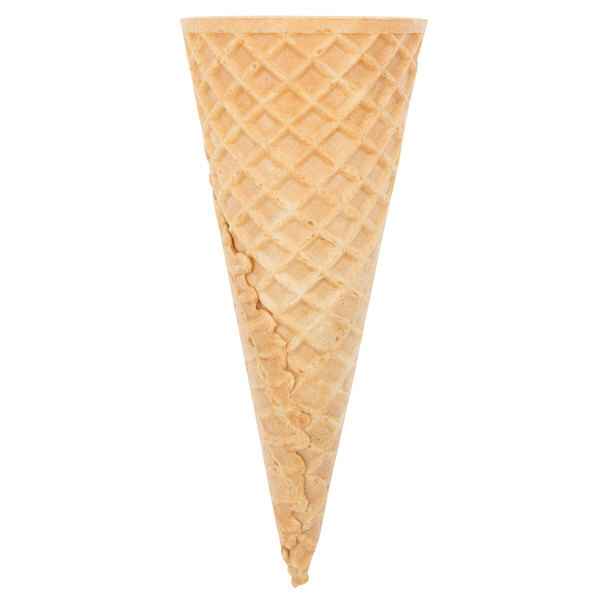 This cone is fresh, crispy, and crunchy, making it a great, tempting treat for customers! 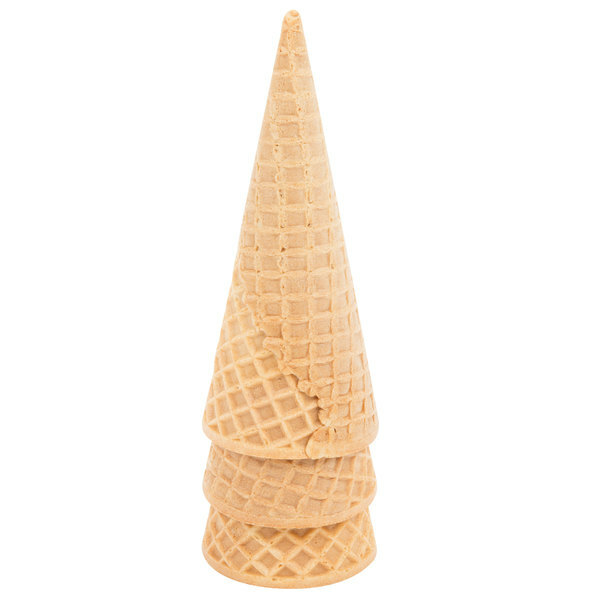 Sugar cones enhance presentation and taste, as opposed to serving frozen desserts in a bowl. 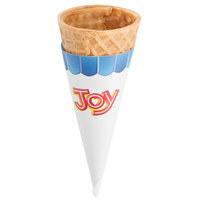 Joy #310 sugar ice cream cones are stacked in layers and enclosed in a poly bag. The self-supporting inner packing permits dispensing right from the box. "We recently opened our ice cream shop and these sugar cones are a fast seller. We love the neatness and lightly sweetned taste of the cones. I will definately be buying more cones in the near future." 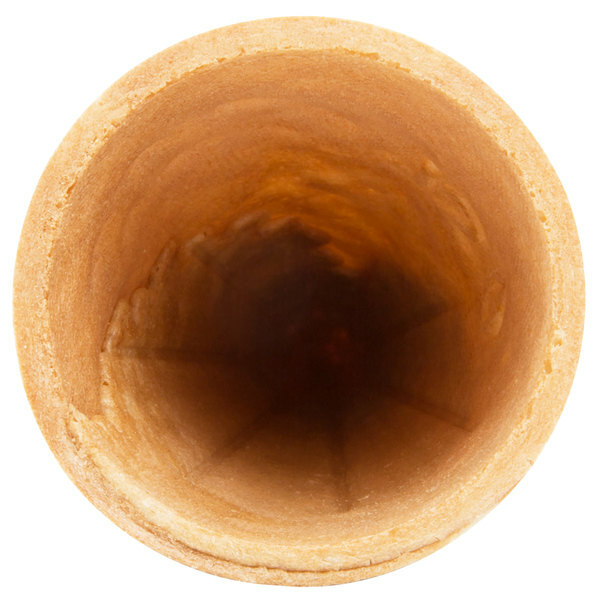 In order to produce the finest sugar cone, brown sugar is used in the baking process. Many other brands use white or liquid sugar with added molasses, which gives a burnt aftertaste when compared to Joy's recipe. 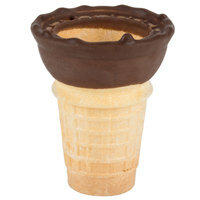 Stack this cone for easy storage that won't take up precious counter or shelf space. Plus, the self-supporting inner packing permits dispensing right from the box. 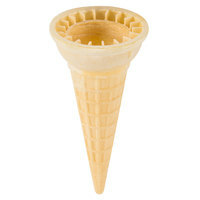 Showcase all of your most popular ice cream flavors in this cone's classic, pointed, conical shape. 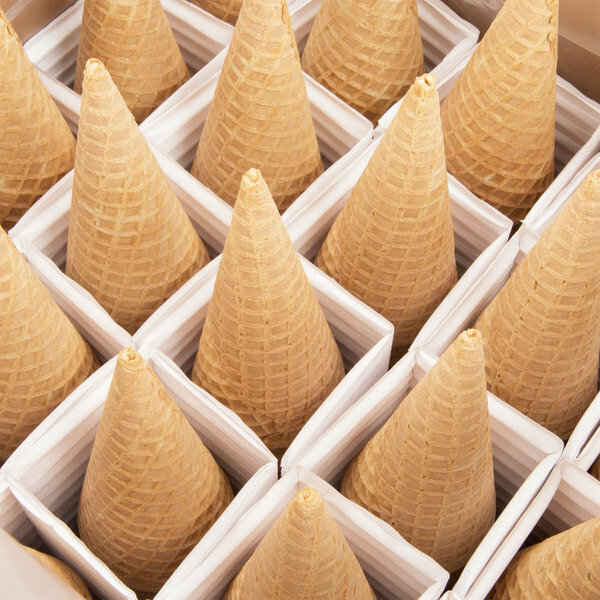 Deliciously crunchy and irresistible, these Joy cones are sure to satisfy! Family owned and operated since 1918, Joy is an old-fashioned favorite that continues today as the leading ice cream cone company. From mixing the batter to the baking process, quality and great taste is ensured with each and every Joy cone. This is a really excellent Small Size Cone for a child that is too small to handle the complexities of grasping a waffle cone. The kids also are really happy with the taste. These cones were great! They were packed safely so we had no broken cones (although we used them in shakes so we broke them anyway). They also stayed fresh for several months without getting stale! They stayed crisp through sitting in a shake as well. I do NOT recommend this! For whatever reason these cones are highly breakable and we've had half the boxes break in shipping/transport. They aren't packed in any Styrofoam or small airbags, so more often then not, you may get to actually use only 50-60% of what comes. We buy the same item items from another vendor who packs them differently and even uses a different shipper and we have had minimal broken cones. These Sugar Cones are great! Super affordable and really nice quality. We use these for treats at our shop, and work really well with our products! These are highly recommended. You cannot beat the fast shipping and the joy count brand. The 800 count her case is also nice and saves me from ordering more often. These are very well packaged and never come broken. Tasty Cone is an understatement! The Joy #310 Sugar Ice Cream Cone is a popular one in our shop, they also stay fresh for a very long time! The cones that made it through the shipping process without being broken seemed to be a nice little cone. 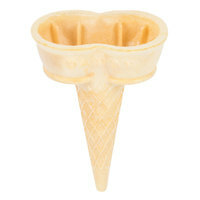 We ordered one box of these cones to try in our new ice cream shop, we will have to find a better way to get these shipped, when we opened the box we found that over half of the cones had been broken. Bummer...We will try to source locally. 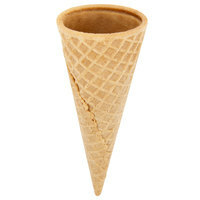 We are sorry your cones arrived broken; a Customer Solutions Representative will contact you about this shortly! A nice size sugar ice cream cone that is great for single scoops. The sugar cone tastes fantastic and is always fresh when it arrives. 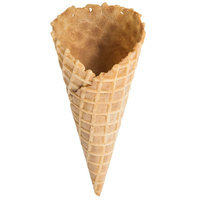 These sugar cones are a cost effective way to offer a choice among cake, sugar, and waffle cones. They arrived fresh and in one piece. these are an amazing topping for any dessert, we crush them so they are bite sized. great texture, taste and most of all people love them. Yum! Flavor is great, the cones themselves are nice and sturdy which is a huge plus and the size is just right. No complaints here. Well made sugar cone that tastes delicious! They hold up well to different types of frozen ice cream or yogurt plus toppings. They shipped nicely and arrived in good condition so you have little waste. Good price too. 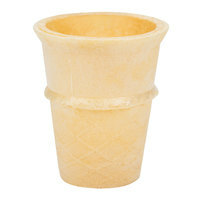 We ordered these cones to make "cookie dough cones" - a fun spin on the ice cream. All of the cones came promptly and none of them were broken. They were true to size and the best price we could find after looking at various sites and business sources. Will definitely be ordering them again as needed. 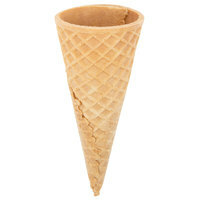 Easily one of more popular products during ice cream season, these cones are outstanding both in taste and freshness. My only issue is that several of ours broke at the top around the opening to the cone and could not be used. I will be buying again. We are quite happy with these cones. So often, you order a case of cones and lots are broken. Not these! They are packaged well and taste good. Want bang for your buck? Try these... they are delicious and economical. They are a hit for our Lab Week festivities. You will love them. Joy sugar cones are of excellent value and quality. These sugar cones taste great and broken ones can be used as an ice cream topping. Wow - Who knew smores could be so good - and easy. Our kids made some by alternating mini-marshmallows and chocolate chips in these amazing cones. gooey chocolatey and no mess. Don't know if I will do it any other way again. We recently opened our ice cream shop and these sugar cones are a fast seller. We love the neatness and lightly sweetned taste of the cones. I will definately be buying more cones in the near future. These worked out really well for an event we did. They were packed well, only had a few broken ones but I would use them again. These cones are a great deal: high quality, good price, quick shipping, just what you would expect from the brand. Will definitely be purchasing again once our supply gets low.